For five years, 8Bitdo has been creating near-perfect wireless clones of your favourite classic gamepads, improving the experience of emulating retro games on modern devices. But if near-perfect isn’t perfect enough for your discerning gaming tastes, the company is now selling kits that should make it dead easy to upgrade your original Nintendo and Sega controllers with Bluetooth, without requiring any electronics know-how, or soldering. 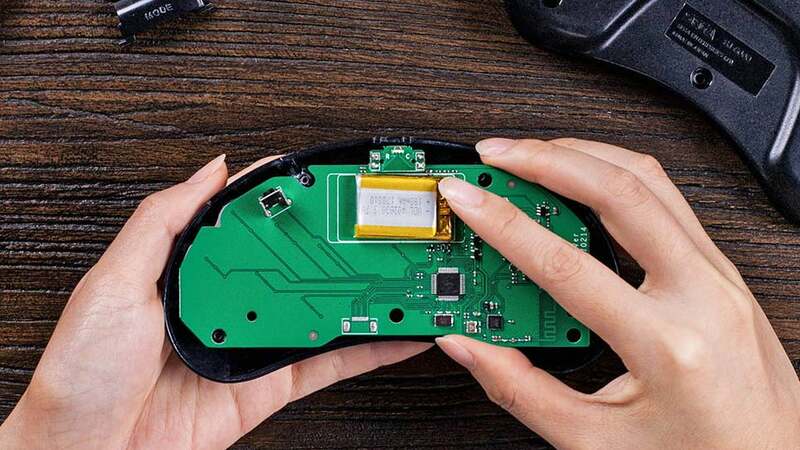 If you’ve ever cracked open a gamepad to try to fix an unresponsive button, or to just clean out all of the Doritos dust in there, you might have noticed that the controller’s cable is permanently connected to the circuit board inside. So to make the wireless upgrade process as easy as possible, 8Bitdo’s new kits swap out all of the electronics with an entirely new circuit board that has a Bluetooth chip and a rechargeable battery already onboard. There’s no hacking, soldering, or any kind of modifications required on the original controller’s housing, so how do you charge the upgraded gamepad’s battery without the addition of a USB-C or microUSB port? The hole where the cable once entered the controller gets plugged with a glowing port that provides visual feedback on the status of the gamepad (battery level, active connections) but also serves as a charging port, using an included but proprietary 3.5mm headphone jack USB cable.